Pandora-Gilboa’s Lillie Nofziger hits a return against Miller City’s Katelyn Kuhlman (23) and Kylie Berner during Tuesday night’s match at Pandora-Gilboa. See more match photos at LimaScores.com. Miller City’s Katelyn Kuhlman hits a spike against Pandora-Gilboa’s Makayla Kinsinger during Tuesday night’s match at Pandora-Gilboa. 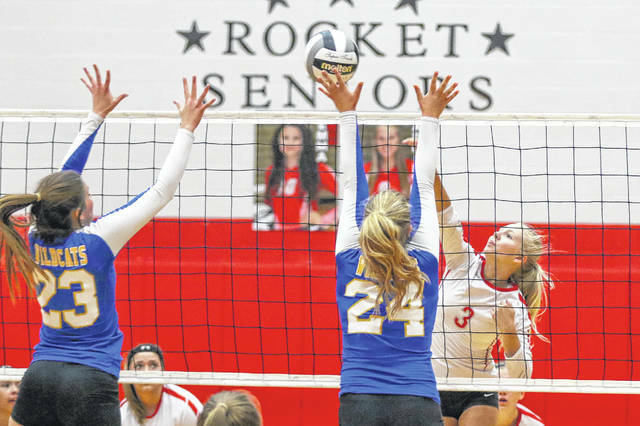 PANDORA — Miller City improved to 6-6 on the season with a 25-15, 25-11, 25-17 victory against Putnam County foe Pandora-Gilboa in high school volleyball Tuesday night. Kyle Berner and Katelyn Kuhlman each had seven kills, Brittany Kuhlman had 18 assists and three aces, Sofie van Wezel had six kills, Cayla Troyer had 12 digs and four aces and Abi Lammers ahd 17 digs for the visiting Wildcats. P-G stats were not reported by deadline. Ottawa-Glandorf and St. Henry remain atop the rankings in Division III and IV respectively in the lastest OHSVCA Coaches Poll. The Titans received 18 first-place votes and 362 points with Liberty-Benton (339 points) in second place. The Redskins receive 36 first-place votes and 402 points followed by New Bremen (two first-place votes, 332 points), Fort Recovery (281), Jackson Center and Leipsic (174 each) and Marion Local (152). New Knoxville (27) is in 18th place. CONTINENTAL — The Vikings won 25-12, 25-10, 25-9 to move to 10-1 overall and 3-0 in the Putnam County League. Hayley Heitmeyer had 21 kills and four blocks, Carlee Siefker had nine kills and 13 digs, Brooke Brown had six kills and 11 digs, Liz Schecklhoff had six kills, Selena Loredo had 26 assists and five aces, Lyndie Hazelton had 10 assists and Kacey Dulle had 14 digs for Leipsic. COLUMBUS GROVE — The Bulldogs won the Northwest Conference match 25-11, 16-25, 25-22, 31-29. Rylee Sybert had 13 kills and 10 digs, Haley Radabaugh had 12 kills, Cassie Heilman had four aces, Becca Choi had 27 assists, nine digs and three aces and Amy Vorst had 17 digs for Grove. LIMA — The Thunderbirds won 25-12, 25-14, 25-16. Rosie Williams had 11 kills, Hannah Riepenhoff had 26 assists, Victoria Lauck had 11 digs, Jocelyn Morrisey had 10 kills and Kennedy Parker had three aces for LCC. Spencerville stats were not reported by deadline. PAULDING — The Panthers won 25-20, 29-27, 25-22. Katie Prater had eight kills, Ameri Seferd had 17 assists and three aces, Kylie Monday had 15 digs and Sophie Bricker had seven digs for the Pirates. Sadie Estle had seven kills, eight blocks and five aces, Kristen Razo had seven assists and Jalynn Parrett had seven digs for Paulding. MCGUFFEY — The Commodores won 25-21, 25-13, 25-15. Aniya Simpson had 13 kills, Tia Barfield had 13 kills and 10 digs, Annabell Plaugher had 28 assists and five aces and Kalie Klett had seven digs for Perry. USV stats were not reported by deadline. DEGRAFF — The Pioneers fell 25-22, 25-15, 25-21. Sophie White had 20 digs and six aces, Lizzie Helser had six kills and Anna Acklin had 11 assists for Temple Christian. The Wildcats won 25-17, 25-23, 25-16. Grace Klausing had 11 kills and 10 digs, Morgan Mock had 10 kills, 10 digs and three aces, Maclerin Morrissey had four aces, Emily Buss had three blocks and Camryn Hoffman had 13 digs for Kalida. 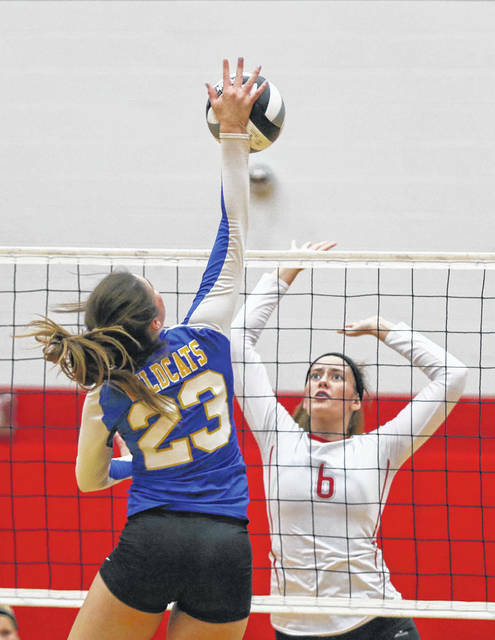 Emma Rex had 10 digs, Emma Nolte had 14 assists and Makenzie Wilson had 10 kills for Wapak. Harrod — The Knights won 25-13, 25-20, 22-25, 25-17. Lexi Gregory had 16 kills and 13 digs, Avery McCoy had 10 kills, Maddy Lamb had 13 assists and Bailey Gregory had 22 digs for Crestview. Anamya Truex had 10 kills, Grace Howard had eight kills, Summer McCloskey had 30 assists and Alex Briley had eight digs for Allen East. The Bulldogs won 25-17, 25-15, 25-16. Sidney Gossard had 20 assists and nine digs, Megan Light had 10 kills, Morgan Swick had 10 digs and four aces and Rilan Conley had eight kills and 12 digs for Ada. Jefferson stats were not reported. BLUFFTON — C0-medalists Hunter Kauser and Fletcher Cook (42 each), Kolson Egnor (45) and Cole Heller (46) combined for Paulding’s winning team score of 175 at the par 36 Bluffton Golf Club followed by Bluffton (182) and Ada (196). Drew Wilson led Bluffton with a 45 and Austin Amburgey had Ada’s low individual total of 48. BELLEFONTAINE — Led by medalist Chasen Poole’s 1-under 34, Graham (154) defeated Wapakoneta (160) and Indian Lake (185) at Cherokee Hills Golf Course. Wapak’s Dylan Timmerman (37) and Indian Lake’s Matthew Risner (43) had the low rounds for their respective schools. LIMA — Medalist Christian Nartker (36), Josh Recker (41), David Peck (43) and Justin Siebeneck (45) combined for the winning total at par 36 Tamarac Golf Course. Riley Creps led Elida with a 41. OTTAWA — Co-medalist Luke Lammers (41), Stevan Stechshulte (45), Boyd Vance III (46) and TJ Michel (49) combined for Miller City winning total of 181 against Columbus Grove (186) and Leipsic (198) at par 36 Country Acres Golf Club. Columbus Grove’s Jacob Oglesbee shared medalist honors with a 41 and Mason Tadena led Leipisic with a 45. LIMA — Medalist Mary Kelly Mulcahy (38), Erin Mulcahy (40), Meghan Mulcahy (42) and Emma Mayers (47) combined for the Lima Central Catholic’s winning total of 167 against Van Buren (209) and Findlay (211) at the par 35 Lost Creek Golfers Club (par 35). SHAWNEE TOWNSHIP — The Indians moved to 7-0 in Western Buckeye League matches. Singles players Aria Patel, Kunmi Ojo and Alotus Weid and the doubles teams of Sanjana Rajasekaran and Katie Clark and Ella Atkinson and Lade Onamusi all won matches. The Redskins fell to 7-1 in league competition. BATH TOWNSHIP — Singles players Esther Bolon, Ruby Bolon and Fayme Ghandi and the doubles teams of Regan Canter and Emily McNett and Chloe Rieman and Emily Wood all won matches. CONVOY — Kinsey Helser and Ally Richardson had three goals each and Olivia Silone had one tally. Julia Meyer contributed three assists. Lauren Criblez got the shutout in goal. BATH TOWNSHIP — Faith Kindig had the match’s only goal with an assist from Chandler Clark. Emily Rocca got the shutout in goal. CELINA — Emily Keith had the match’s only goal. OTTAWA — Sophia Fusillo and Haley Mulcahy each had a tally and Grace O’Connor got the shutout in goal as the Indians improved to 9-0 overall and 4-0 in the WBL. KALIDA — Lauren Langhals had three goals, Kathryn Siebeneck and Sydney Wurth had two tallies each and Racheal Basinger, Peyton Wurth and Mya Schmitz each had goal. FORT JENNINGS — Savanna Siebeneck had two goals and Madison Neidert tallied one for the Musketeers. Autumn Thompson had both Grove goals. FINDLAY — Connor Krouse and Gabe Hovest each had a goal for Kalida. ADA — Chris Reyes had two goals and Ada’s Nick Kamatali, Skylar Williams and Brendan Sheridan and New Knoxville’s Jose Maria Rabadan each had one. VAN BUREN — The Musketeers fell to 1-7-2 on the season. LIMA — Tickets for Friday’s Lima Senior football game at Whitmer High School will be available in the Lima Senior Athletic Office from 9 a.m. to 4 p.m. Thursday and from 9 a.m. to 3 p.m. Friday. Presale tickets are $5 for students and $7 for adults. All tickets at the gate are $7. Kickoff is at 7 p.m. at Whitmer Memorial Stadium. Kewpee coupons are still available in the Athletic Office. Books are $5 and contain five coupons good for a buy one hamburger and get a hamburger and a drink for free. Coupons expire Oct. 20. For information call 419-996-3050.